Game-changing fitness supplement gets a “boot camp” style digital transformation. 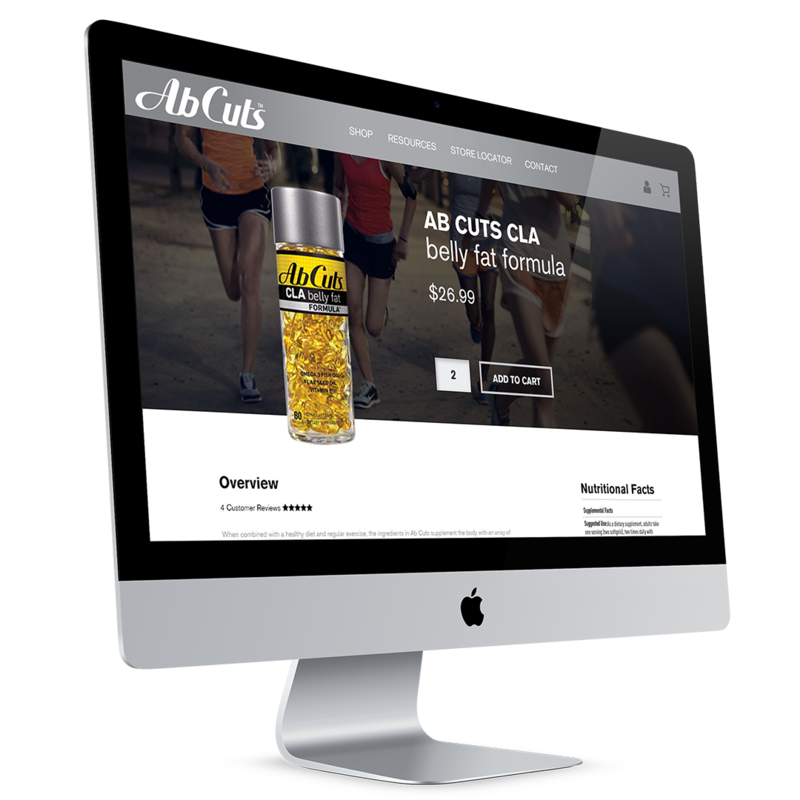 Ab Cuts is a popular fitness supplement found on the shelves of every Costco, Walgreens and GNC in the United States. The brand was looking for an opportunity extend into consumer direct sales through a dedicated e-commerce site. Visual identity and user experience design played a critical role in this initiative. Ab Cuts needed a fresh design that would resonate with their young adult audience while invoking the clinical professionalism of the R&amp;D behind their product. Digimix was brought in to contribute a digital strategy, design a completely new website and develop it with a WordPress content management and enterprise level e-commerce system. Once Ab Cuts provided us with their existing set of brand assets, a logo, brand primary color and a brand font, we took it from there. Our highly iterative design process was guided by extensive competitor research and marketing analysis, including user personas and position diagrams. We studied hundreds of comparable websites in a diligent design precedent analysis process. Each design was hand-crafted into reusable responsive web design templates, coded to the highest quality standards. This original website designed and developed by Digimix includes a responsive design with mobile, tablet and desktop views, a WordPress content management system, an online store powered by Woocommerce, custom API integrations, social media integrations, and many other awesome features. Digimix’s contributions extended beyond design and development as we advised on strategic decisions about the various technology platforms used in the project, and how to efficiently integrate them with existing operations at Ab Cuts. Under the hood, Digimix built a collection of templates that can be used by the Ab Cuts marketing team through the WordPress dashboard for visual editing. This enables the marketing team to easily create fully styled landing pages for products, branded content, and promotions with a few clicks. The WooCommerce shopping cart is an easy to manage e-commerce system. Woocommerce is great for handling the Ab Cuts products line requirements, including a small collection of SKUs with a few common product configurations like sizes. Thanks to some web development work from Digimix, the e-commerce platform offers the security, enterprise system integrations and scalability needed for a big box brand’s online store. The Digimix team worked directly with Ab Cuts brand manager, CTO, and CEO, advising on high-level technology decisions. This collaboration leads to us engineering the best way integrate the website with their existing accounting, supply chain management, and business management software. Since launching Ab Cuts with Digimix’s responsive designs with mobile, tablet and desktop versions, the brand has enjoyed a massive increase in visitors. The new mobile experience makes it convenient for customers to access the wealth of resources whether their at the gym or in shopping in stores like GNC, Walgreens or CostCo. The design process Digimix established a new brand style guide for Ab Cuts, improving brand assets for future operations. By automating activity between the online store and the brand’s CRM, accounting, SCM and shipping systems, Digimix delivered an e-commerce platform that is an engine for business growth. Implementing the user-centric Digimix designs on the e-commerce platform lead Ab Cuts to benefit from a high conversion rate, with online sales stronger than expected. 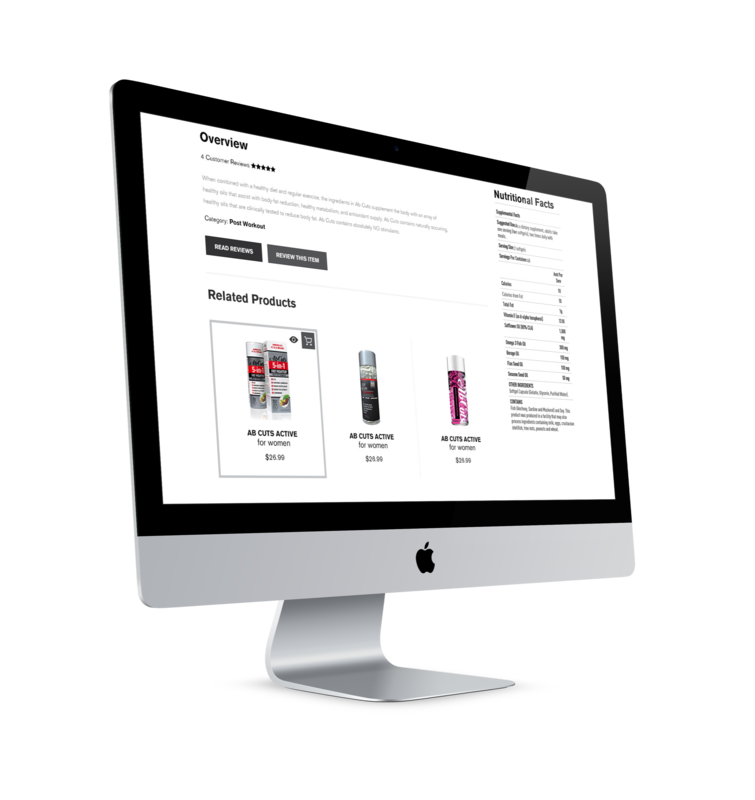 Digimix set the stage for operational for success by setting up options for website managers to easily create robust product landing pages complete with up-sells, cross-sells, branded content and health resources. Digimix naturally integrated relevant, interesting and useful content into the user shopping experience, creating a sense of trust, community, and expertise for the brand in the mind of the user. Brand trust is further enhanced by featuring authentic reviews from verified social media accounts on shopping pages. The marketing team at Ab Cuts is able to connect their growing Instagram following with the site using a special Instagram feed that allows website editors to moderate Instagram photos shown on the site based on a hashtag. Unlocking the boundaries of only featuring Instagram photos from their own account. The offline shopping experience was not left out of the equation. Digimix identified a major challenge faced by key customer segments. People interested in buy Ab Cuts on demand had no way of determining where they could reliably find the product. Digimix resolved this customer pain point by developing an Ab Cuts store locator powered by Google Map. The store locator can automatically get a visitor’s current location and suggest stores nearby that are carrying Ab Cuts. Rolling out the Google Maps store locator feature helped produce a sweet bump up for in-store sales. What’s next for Ab Cuts and Digimix? As we monitor the performance of the new AbCuts.com, Digimix will continue consulting to strengthen connections with their established audience and reach new demographics. Are you investigating digital agency partners for an e-commerce development project? We offer consultation to qualified businesses, no strings attached. Let’s talk. Responsive Web Design - Bespoke responsive web design crafted for a mobile-first audience. Every feature is fully touch-enabled and fits nealty on popular screen sizes. Ecommerce Integration - We automated the processing of data from the Woocommerce shoping cart system to the companies ERP and CRM systems, including a supply chain management, NetSuite accounting, Constant Contact email marketing and Salesforce CRM.